As part of the Creature Contest, I thought it would be a great idea to cover Hosting and Site Operations in extensive detail. I'll be demonstrating how you can use multiple Site Operations and the Host/Hosting Fields to attach units to each other, designate launch/impact locations and otherwise create your own patchwork units. For our example we'll be covering the Uberlisk despite there already being multiple tutorials out for it. The reason for this is my Uberlisk actually has the 6 spine crawlers it's supposed to in the locations they are supposed to be. I've also improved upon the concept and adjusted the spine crawlers further to show you just how realistic you can make attachments appear. Hosting and Site Operations are nothing more than points of reference for alignment instructions. Either you're linking two objects together with references so that they can "speak" to each other, or you're telling an object that it needs to be here and/or moved to there. If actors are the puppeteers, units are the puppets and behaviors/effects are the puppets features then hosting/site operations are the strings. They tell everything where they need to be. Before we begin, it's important to understand how Local Offset, Explicit Rotation and Variance Rotation Site Operations work as a large part of combined models involves them. To help visualize, open any unit in the previewer and move the camera until you are facing the front of your unit. Now overlay the the coordinate system in your mind and that's how these Site Operations will base their directional adjustments. One thing to note is that while it preserves its rotational axis, some anchor (attachment) points will actually tilt this axis to align it with the plane it's attached to. In other words, if you attach it to a surface that's at a 45 degree angle to ground, the attached model will also be at a 45 degree angle. Thus it's important to pick the right anchor point to move from before applying offsets. It's important to note that the actor won't rotate with its host if used on attachments. In order to function like an attachment should, you must enable Local. If you do not, the rotations will be use the map coordinates instead of the unit's facing as a reference. Unlike Explicit Rotation, this Site Operation does not change a units facing or rotational axis. Instead, it changes its relationship with its existing facing and axis. More specifically, it allows you to tilt a unit away from its facing/axis without being locked in that direction. This makes it ideal for attachments to mobile objects. While still facing your unit, the Up Angle tilts it to the left of its axis and the Forward Angle tilts it up from its facing. Given that both fields are only angles, it's pretty easy to tilt as desired once you understand what direction you are tilting. One very important disclaimer is that this Site Operation is currently very buggy. Sometimes the angle will tilt the object in the opposite direction which is bad for Forward Angles as it puts their face in the ground. If used with other Site Operations, especially if you attach to an anchor, the model will slowly "fall" into the ground as the object moves about. This can be especially frustrating if you have the perfect setup and suddenly the attachment droops. That being said, be sure to test repeatedly to make sure you achieve the desired effect. As of now, I don't know any way to ensure 100% success and I suspect it's just another area of the editor Blizzard isn't finished fleshing out. First and foremost, I have not included the Uberlisk's abilities because they are not related to the tutorial and would just be extra work. I am willing to update the tutorial by attaching a 2nd map that has the abilities incorporated if this is the popular demand, but I won't be adding them to this tutorial. In a future tutorial I might pull that map off this thread and create an Actor/Ability tutorial that walks through making those abilities for the Uberlisk you've already created with this tutorial. I won't make any promises at this point in time, however. For now, focus on the Hosting and Site Operations as those are what allow the Uberlisk to function. Simply match the Damage to its Missile. We'll come back and pick our ammo unit later on. open Options and check (Hidden and Continuous Scan) while unchecking everything else. Duplicate the above weapon 5 times and change all L1s to L2s, L3s, R1s, R2s and R3s, matching the weapon to its missile and damage effects. 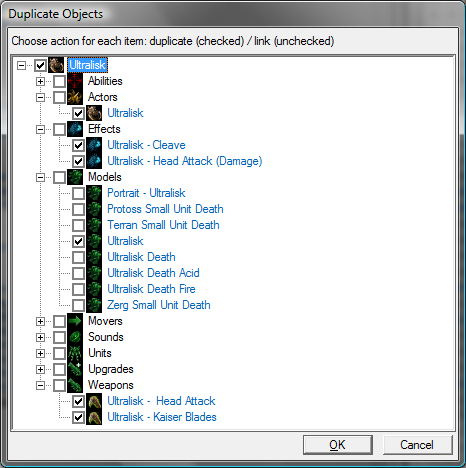 set Editor Prefix* to "Missile -"
Start by renaming the Ultralisk model Uberlisk. Go on to rename the actor Uberlisk and the weapons Kaiser Blades ("Uberlisk -" in the Editor Prefix field) and Head Attack ("Uberlisk -" in the Editor Prefix field). Now delete any abilities, command card buttons or behaviors you don't want and decide on your stats (HP, armor etc). Finish by renaming the unit Uberlisk and the effects Cleave (Damage) ("Uberlisk -" in the Editor Prefix field) and Head Attack (Damage) ("Uberlisk -" in the Editor Prefix field). set Editor Prefix* to "Uberlisk -"
It's important that Backswing is 0.0 because this number determines how the unit can fire any of its weapons after using this weapon. If it's anything but 0.0, other weapons used after it will be delayed. It's also important to uncheck Linked Cooldown so that multiple weapons can fire at once. Because we have a lot of actors and each one has an important role, we're going to divide this tab into multiple sections so that we can better understand what is happening. These two actors are going to "anchor" our Spine Crawlers to the Uberlisk's attachment points so that they move with its animations. Without these, the attached actors will just float in the air where you put them while following the Uberlisk around. We won't need to make one for each Spine Crawler because these simply pick the starting point and the angle relative to the Uberlisk. These actors are what move the Spine Crawlers from their anchor point. I've already done the tweaking part, but normally you would guess where you want them and then slowly nudge them until you've got the model where you want it. By combining these actors you can move a model anywhere along the Uberlisk's head. If you want another part of the body, simply change the anchor point and adjust the offsets. Now there is currently a bug that prevents you from adding a SubName to Signal events. So we're going to have to manually edit them with Raw Data View. Press Ctrl + D and double click on Events +. This will now allow you to type anything you want into this field. Find both instances of "Signal" and change them to "Signal. *.Returned" so that the event will work properly. Once finished, press Ctrl + D again to clear Raw Data View. DOUBLE CHECK THAT YOU MADE THE CORRECT CHANGES. Now it's time to explain what all the Hosting fields and Signals are for. Host + determines what the actor will attach itself to. By adding the alias _Unit, this actor will find an actor with this alias (in our case the Uberlisk) and attach itself when it is created. You DO have the option of picking a specific actor and sometimes this is better than using aliases. A good example would be when you are attaching multiple objects together that share aliases. If your main model has _Unit and the first attachment has _Unit, the next attached model might be confused on which to attach to and end up attached to the wrong model. Specifying the actor helps avoid this. Host Site Operations + determines where on the "Host" actor this actor will attach itself. The Site Operations we have tell the unit to anchor itself at the given location and then adjust itself by the given values. This puts our Spine Crawler where it needs to be. It is VERY important that you include a space between each operation otherwise it won't stick when you click ok. Furthermore, the ONLY way to use multiple Site Ops is by using a space between them. Many mappers have made the false conclusion that you can't use more than one Site Op because they didn't figure out that you have to use a space instead of a comma or semi-colon. Don't let this be you! Hosted Attachments + is somewhat complicated, but the basic idea is that it allows the actor to be a reference point for other actors. In our case, it will allow the Tentacle's attack actor to animate the "stretch" attack. Without this hosted attachment, the tentacle won't stretch to the target at all. It will just "wiggle" a little each attack. Additionally you can use this field to create multiple reference points for complex multi-attachment units. Duplicate above actor 5 times and change all L1s to L2s, L3s, R1s, R2s and R3s, being careful to link each Actor to the correct parts. This duplication process is the most common source of errors for this actor and all following actors. Be sure to double check that you have associated all L1s with L1s, L2s with L2s and so forth at each step so that your tentacles will attack properly. Duplicate the above actor 5 times and change all L1s to L2s, L3s, R1s, R2s and R3s, being careful to link each actor to the correct parts. This particular actor is what will allow your tentacle to fire from location we want. It attaches itself to the Spine Crawler actor at the given anchor point. This anchor point is where an actual Spine Crawler's tentacle originates from so naturally we want our tentacles to originate from this point as well. These events aren't your typical events, but they are very important. Motion Phase Start is how your missile will reference the Spine Crawler it shoots from, allowing it to stretch from the hosted attachment (SpineL1Tentacle) to the target. Once it reaches the target, Missile Tentacle Return is what allows the tentacle to retract back to the Spine Crawler. Without this it will simply stretch out and "pin" itself to the target, twitching periodically to signal attacks. Knowing this, you can actually use this to purposely pin targets with this animation so long as you ensure that the missile only fires once. Then you can have Missile Tentacle Return action occur when the effect that immobilizes the target ends. Thus the missile fires, sticks the target which is immobilized by an effect and then retracts when the effect ends or the target dies. Think "Neural Parasite" but without that annoying infestor. If you encounter problems that you can't fix, let me know about it here and we'll figure out what happened. Man you're good at typing haha. I practice in front of the mirror each night before I go to bed. . .
First off thanks for the awesome tutorial I'm sure it took lots of work. I got stuck at one point though. I wasn't able to modify the number to 7. It would always stay at 0. Even in your example file, it's set correctly to 7 but I'm not able to modify the value. When you begin attaching models to other models, only one of these models can be designed as the "unit" with everything being an extension of that unit. The only exception that I have seen is if you use triggers to make units appear on top of each other and chained together. So in your case, the Thor is the unit and the Missile Tower is just an extension of the Thor. The problem with this is that you can't simply tell the effect to launch from a point on the Missile Tower because it only uses the unit as a reference for launching projectiles. Everything on the Missile Tower doesn't exist. This tells the Site to create itself at one of the Missile Towers weapons and tells the missile to fire from the site that is now attached to the Missile Tower. Does this make more sense? Also, does it help fix your problem? Prozaic - you are a data editing beast. Good work again. This is very well done ProzaicMuse. I understood all of it since I wrote the original guide on this. I like how detailed you got about what each option actual does and I have to admit I never thought about using the Attachment Offset Actor to properly control the placement of the SpineCrawlers to the Uberlisk. This is much more inline with the Uberlisk that was showcased at Blizzcon. I look forward to seeing all the crazy creatures people come up with using your guide as a template! thanks for help i think that i do now understand the Meaning of Site Actors. But it dont work for me, I hope i did all right that you said. I just also wanted to say excellent job, it's a very helpful tutorial. @Kroemel - I'm looking at your map right now, but I don't have an immediate solution. I've made some improvements (like the missile firing from the Thor instead of the ground), but I think your problems are stemming from the fact that you have your copied Effects and Actors linked to some of the stock Effects and Actors. You should go through and duplicate the stock objects you are using so that you can rename them and ensure that only your edited stuff is linked together. While you're doing that, I'll see what I can do about getting it to launch from the correct location on the current map. For what it's worth, you've actually got the Hosting an Site Operations setup correctly. The only issue is you used ALL of them rather than just some of them. You only need the Site Actor, Site Operations Actor and the Host actor to make this work. You don't need the Return Actor, Return Site Operations, Hosted Attachments or Host Supporter. I believe I've almost got this, but I absolutely cannot find what is causing my tentacles to not actually reach out and hit the target and instead do that little "wiggle" thing that was mentioned in the hosted attachments section. I'm about to say screw it, turn them into spores, and just have him shoot spores instead. Wow Prozaic Wall of text! @JPLetters - Have you checked your Host Supporter + field and the missile's actor events that target the ::Supporter? This is what transfers the animations to the Spine Crawler. So if you have Host Attachments + setup properly it's possible this is what's causing the trouble. All is well now... ahhh.